Legacies were cemented, stars were made and commercials were watched. 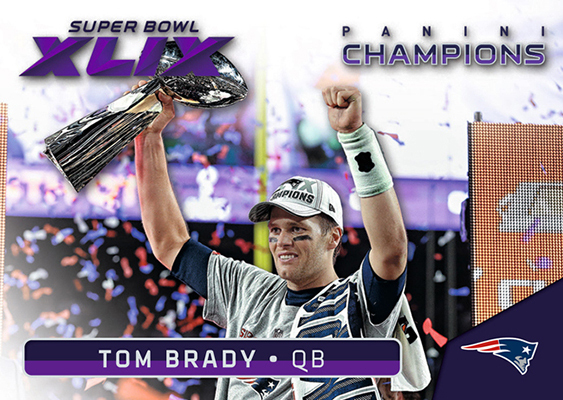 Super Bowl XLIX is in the books with the New England Patriots walking away with the Vince Lombardi Trophy. 2015 Panini Super Bowl XLIX football cards spotlight the team and their victory with a small factory set. The majority of the 25-card checklist consists of player cards of New England players. Both sides of the ball are represented with key offensive guys like Tom Brady and Rob Gronkowski being joined by such defenders as Derrelle Revis and Vince Wilfork. 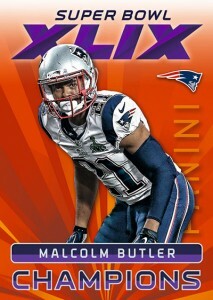 Malcolm Butler, who made the instant-classic interception to seal New England's win, has one of his first individual cards in the set as well. The final seven cards are dedicated to in-game highlights, showcasing some of the moments that were key to the Patriots' win. These have a slightly different design on the front to accommodate the added space needed to show the play. 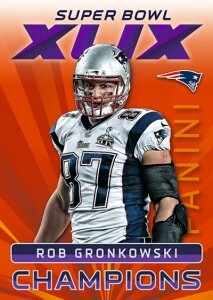 Panini has images of the entire set posted on their blog.